Jilumol Thomas has done more — and with far less — than most of us can imagine. This 23-year-old young woman has defied the odds again and again, and is continuing to show others a quiet heroism that comes from trust in God. Jilumol Mariott Thomas — “Jilu” to her friends — was born the second of three children of Thomas Nellanikkattu and Annakkutty of Karimannoor near Thodupuzha in Kerala, the southern state of India. Tragically, she was born without arms. When Jilu was just four years-old, her mother died. Jilu was taken to the Mercy Home run by Sisters of the Destitute at Changanassery, a small town in Kerala, India supported by CNEWA in its childcare program. At the Mercy Home, Jilu got support in abundance from the sisters. They set up a canvas for Jilu and gave her color pencils. In time, she learned how to battle her physical shortcomings. She started practicing graphics on a computer. Earning high marks in school, she eventually graduated and secured a degree in Animation and Graphic Design from Media Village in Changanassery. After earning her degree, she started working on some computer-related jobs for private organizations. She later served as an office assistant at a church-run hospital at Paimkulam. But her dream was to make a career in graphic design. Bishop Mar Sebastian Adayanthrath, Bishop Auxiliary of the Syro Malabar Catholic Archdiocese of Ernakulam-Angamali, invited Jilu to join Viani Printing Press, run by the Archdiocese in Kochi city. A work space was specially created for Jilu at Viani by rearranging the computer table, mouse and keyboard; it was set up in such a way that she could work with her feet. The little girl born without arms or hands is now reaching and touching many with her talent — and her spirit. Jilu credits her faith, her family, and the sisters who raised her for teaching her what is possible. Msgr. Giampietro Dal Toso, secretary-delegate of the Dicastery for Promoting Integral Human Development, visited the city 18-23 January, accompanied by Cardinal Mario Zenari, apostolic nuncio to Syria, and Msgr. Thomas Habib, an official at the nunciature, the Vatican said 24 January. Iraqi soldiers inspect the debris on 22 January at St. George’s Monastery (Mar Gurguis), an historic Chaldean Catholic church on the northern outskirts of Mosul, which was destroyed by ISIS in 2015. The U.N. is racing to prepare emergency aid ahead of the battle for western Mosul. 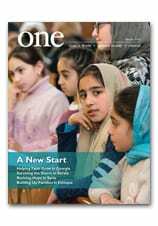 Journalist James Jeffrey reports on efforts to grow the faith in Ethiopia for the Winter 2016 edition of ONE. Here, he shares some meals with catechists —and shares some further thoughts with us. At the end of a day full of evangelical fervor, I found myself reflecting on how a simple dinner, that act of breaking bread with others, could be nourishing physically but also mentally and spiritually — plus particularly useful for a journalist with his notebook at hand. My first night in the balmy lakeside town of Bahir Dar, just before the start of the weekend university chaplaincy program on the role of evangelicalism in modern Catholicism, coincided with the conclusion of a preceding course, similarly instructing missionaries, religious sisters and laypersons. Joining them for dinner, as I sat eating from my plate of injera — Ethiopia’s indigenous spongy pancake-shaped grey bread — topped with rice, beetroot, potato and other fresh vegetables, it was hard to imagine the somewhat diminutive-looking religious sisters who sat around me were, in fact, evangelizers. But I was soon reminded of what inner strength can lie beneath the surface. “It took me about two years to learn Amharic,” said Sister Veronica, a soft-spoken Kenyan missionary sister with a ready smile, working in the Benishangul-Gunzu region near the Sudanese border, a remote and hard to reach place all but invisible from contemporary Ethiopia. “More important than what I miss is what I find,” said the Rev. Goaquim Silva, a Portuguese missionary priest based in Ethiopia for six years. I began to understand why many people find missionaries unsettling figures — they have a disconcertingly humbling effect on oneself. Dinner for each of the following two nights occurred at the table of Abune Lesanu-Christos Matheos, Bishop of the Bahir Dar-Dessie eparchy, along with those running the university chaplaincy program, and other various guests invited by the bishop. Conversation flowed, covering topics from the dilemmas of evangelical worship to the remarkable history of Christianity in Ethiopia to global collisions between the major faiths of the modern world. My main problem during all this was trying to eat my delicious meal of injera — eaten with one’s hand — and scribble in my notebook while following the thought-provoking conversation. “People often just want to sing, there’s no reflection or critical thinking,” said Nancy Greenhaw, an American Catholic instructing on the program. There was a chorus of agreements and nods from around the table. The bishop paused in lifting his injera clasped between fingers to his mouth. During one meal, sitting on my right was Magdela Wolnik, a Polish journalist producing a documentary about Ethiopia for the international organization Aid to the Church in Need. Like me, she barely said a word, content to listen to the words of those who know more, and benefit from them. Those around me had recourse to speak of another — who, in all likelihood, knows more than they do. I’m not sure who said that; by this stage I was really struggling with my injera, pencil and notepad. But the point hit home. Read more in Ethiopia’s Sleeping Giant in the Winter edition of ONE.